Bharatiya Jana Sangh leader late Nanaji Deshmukh, singer Bhupen Hazarika and former president Pranab Mukherjee were on Friday conferred the country’s highest civilian award Bharat Ratna. In an official statement, the government said Deshmukh and Hazarika were conferred the award posthumously. Mukherjee was president between 2012 and 2017. “He has served the nation selflessly and tirelessly for decades, leaving a strong imprint on the nation’s growth trajectory. His wisdom and intellect have few parallels. Delighted that he has been conferred the Bharat Ratna,” the PM tweeted for the former president. “Nanaji Deshmukh’s stellar contribution towards rural development showed the way for a new paradigm of empowering those living in our villages. He personifies humility, compassion and service to the downtrodden. He is a Bharat Ratna in the truest sense!” the PM also said. Pranab Mukherjee, who was one of Congress’ senior-most leaders for decades, served as the 13th President of India from 2012 and 2017. In a political career spanning nearly five decades, Mr Mukherjee has served as the Finance Minister, Defence Minister and also the Foreign Minister. Social activist Nanaji Deshmukh was a founding member of the Janata Party and one of the senior-most BJP members. He also played a crucial role in the social restructuring programme in 500 villages in Madhya Pradesh and Uttar Pradesh. He died in 2010 at the age of 93. Dr Bhupen Hazarika, a music maestro from Assam is a recipient of Sangeet Natak Akademi Award, Padmashri and Padmabhushan. He was also awarded the Padma Vibhushan, the country’s second-highest civilian honour, in 2012. He died in November 2011 at the age of 85. 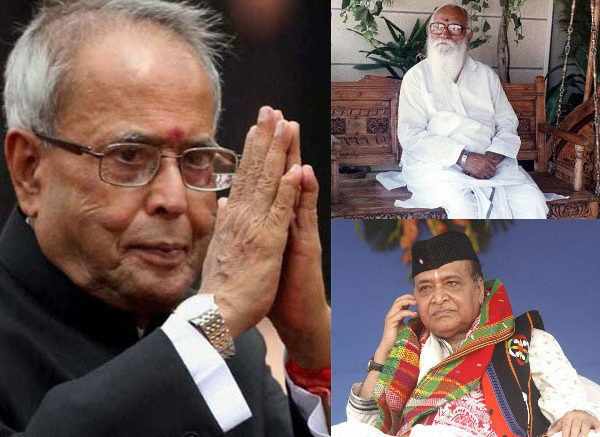 Be the first to comment on "Pranab Mukherjee, Nanaji Deshmukh, Bhupen Hazarika awarded Bharat Ratna"